Starcraft: Mass Recall is a project that recreates the classic Starcraft and Brood War gameplay as well as the entire single-player campaigns within the Starcraft 2 engine. Mass Recall contains 68 maps, 59 from the original Brood War game, 3 that were hidden or deleted on various Starcraft supports, and 6 from the 1998 demo campaign. This mod can be used with any Starcraft 2 version, including the free Starter edition. Do not hesitate to leave feedback or suggestions in the comments below. Reports of our demise have been greatly exaggerated. It's taken too long for sure, but we're getting close to releasing the rest of the campaigns for the latest 7.X overhaul of the mod. We are now looking for testers for the brutal difficulty setting of the upcoming Brood War episodes 4-6, as well as the extra campaign "Loomings" aka "Precursor". Be advised: this difficulty is meant to be unforgiving and won't be for everyone. You should expect to have a hard time. We would hope you have previous experience in Starcraft 2 at the very least, preferably also in Mass Recall or Brood War. Having completed or even played some of MR on hard or brutal difficulty is certainly a plus. The latest available versions of episodes 1-3 include a brutal difficulty setting, in case you want to try a map or two to get a better idea of what this is. Are there any other issues affecting gameplay? Again, we're evaluating the brutal difficulty here specifically. If you're interested, send me a PM and state your preferred race/campaign, if any. I'll get back to you with more details sometime this week. That is to say I might not respond right away but if we're already full, I'll try to notify you ASAP. 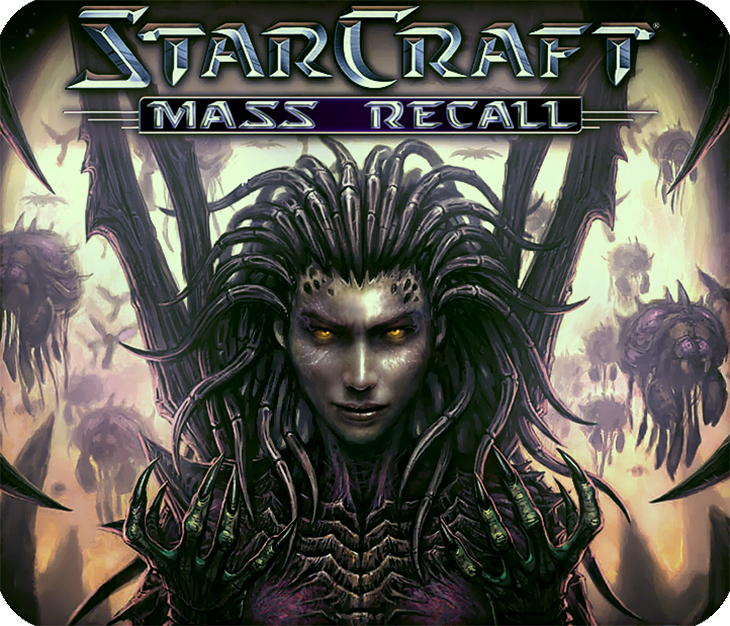 Starcraft: Mass Recall 7.0 is live! We are proud to release the first 3 episodes of Starcraft in Mass Recall for the new 7.0 version! This updated version is the latest and most complete Mass Recall experience to date which includes a slew of new Starcraft: Remastered features including remastered briefings rooms, loading images, story cinematics, improved FMV cinematics, enhanced audio tracks, and more. You can download the project under "Files" and follow instructions for loading. - Stay tuned for the Brood War episodes being released as well as updated "Extra" campaigns, including Loomings, Stukov Series, and the custom remake of Enslavers in Enslavers: Redux! SCMR v7.0 is out, including the first three episodes for now. See the Downloads section below. Stay tuned for the rest. Only available in English at the moment. An all-new redesigned mission briefing that now more than ever closely resembles Starcraft: Remaster's designs. Put the power of classic audio in your control! In addition to the current audio voiceover toggle feature for unit voices between SC2 and SC1 versions, there are now three separate options to utilize classic SC1 sounds for your all your buildings, your abilities, and/or your weapons! More classic Starcraft audio is re-introduced using these options, including the iconic Yamato Gun charging sounds, the Academy screams from Terrans, the Missile Turret's weapon launch, the Sunken Colonies spines, the original Ultralisk's growls, and more! Players now have the option to keep every single sound for units, buildings, weapons, and abilities within standard Starcraft 2 or convert them all to classic Starcraft: Brood War versions! A brand new Model toggle system, whereby players can choose between inspired classic Brood War versions of their favorite units in each race or retain the default Starcraft 2 models. Want the original Overmind portrait? Citadel of Adun model? Academy model? Or do you just want the classic Photon Cannon and Robotics Facility model? Try them all out and choose your favorites! Brand new unit and portrait models by default for many key units and heroes, such as the all new Tassadar and Raszagal unit and portraits. Even Aldaris gets a portrait model upgrade! A 4th level of difficulty: Brutal. For those players who want the ultimate difficulty challenge. All new advanced AI for enemies, improving their skill at casting abilities, as well as allowing them greater randomness and flexibility in sending attack waves against you. No two replays will be exactly alike for a more unique gameplay! You now have the option to enable more custom unique skin models for various units and buildings across certain factions including the rebel Sons of Korhal, the oppressive UED, the enraged renegade Broods, the enigmatic Nerazim, and more! A new "Evolution Pit" section in the SCMR Launcher for experimental goodies and extras including adding extra hero abilities and extra hero appearances in missions! To install the cinematics pack if you've already run the installer without it, replace the "SCMRcinematics" file in your mods folder with the one in the cinematics pack download. SCMRlocal (English) (REQUIRED) Note: contains localized text and subtitles for chinese, french, german, korean, russian and spanish languages. Corresponding language should be selected in your Starcraft II client. For older versions of the mod, see the "Files" section. Don't let the number of steps put you off, the installation part is actually very simple and should only take about 2 minutes. go back to the save menu, highlight the save you just created and click the "show in folder" button. if you can't find this folder, login to your account, go to campaign -> load, click on a save and click the "show in folder"-button. It will take you to the folder you need to move the save file into. when you're at the title screen, save the game again. You can now use this save to launch SCMR, the setup save is not needed. Note that you can still save and load any SCMR map, as long as you're logged in. During any mission, typing "quit" as a chat message will take you back to the menu. Make sure to check out the auto install and manual install video guides also linked above. The end result in these videos is the same, regardless of install method. Also make sure you're using an up-to-date version of Starcraft 2. Param/values/whatever: if lots of texts are like that, you may have a problem with your Mods: delete SCMRmod and SCMRlocal, and re-download them from the links below. If it is only one or two lines (say, a mission objective), report it in the comments section (in that case, please specify which language you are playing in). Dependency cannot be loaded: The mods are not at the proper place. Check that you have put your mods (SCMRmod AND SCMRlocal) in the Mods folder, as on the picture below. Unable to load map: Your maps are not at the proper place. Check that you have put the episode files such as "1. Rebel Yell" in a folder "Starcraft Mass Recall", itself to be placed in Maps, as on the picture above. Other custom campaigns from various authors can be found at the Custom Campaign Initiative. For Brood War-like multiplayer, you can have a look at Starbow. Old time Brood War players may enjoy the Carbot Animations Brood War series. Files "SCMRsetup" and "SCMR Campaign Launcher" should be located in the "Starcraft mass Recall"
Same problem as RobertCL. Followed instructions to the letter, still unable to open map. Hi! found some bugs. 1) shoots a firebat on cliffs. 2) despite the absence of a mark "broodwar tech" enemy builds medics. For example in the mission "Revolution"
Your campaigns will be released only in English, or there will be versions and for other languages how it was in http://www.sc2mapster.com/maps/sc1-episode-1-rebel-yell/ and adjacent projects with it? I was a great fan of the previous version despite the few bugs. Here I cannot even install the game. I followed all steps carefully. Map has been tested, saved and moved to my account. "once loaded, click the "install" button"
I click on Install and I have the error message: "unable to open map"
In the previous version of the game under the account/saved/multiplayer directory, SCMR Campaign Launcher.Map was stored in a "vsAI" directory. Apparently this is a step which is not required here anymore. The sole scenario I can play is the Resurrection IV using the map editor (but I can't manage the speed of units). Using the editor to play the standard maps of your mod lead to the same result: "unable to open map". I had no problem to install the previous version of your mod. I respected each step, why can't it accept when I press the "install" button ? Well, we certainly tried. Hope you enjoy, and any feedback would be appreciated, of course. And hey, if there's anything you can use in your project, go ahead. I replied to you in the TL thread - we'll see. We'll probably have an update ready sometime soonish. Yes, the Retro version includes a lot of extra models. The missing / incorrect decals is one of the reasons many of the models are included as an alternate version. You're welcome! Yeah, the missing mouse is probably caused by skipping the intro. Cutscene skipping is something we'll have to sort out sooner or later. Yes, this is our home page now. Those portraits weren't used because they don't have a talking animation. I can't comment on Duke or Dugalle's portraits (I will admit to being mildly disappointed that they still use the generic Battlecruiser and Jackson's Revenge portraits), but for Kerrigan, I see *NO* reason not to use the one in-game; this is practically what it was designed for. That IS Kerrigan before she was infested. They didn't change the portrait of any character that already had one. Units, yes, but not any actual characters. Is this where the new updates will be shown here? And downloads? I haven't run through all the remake, but you did a great job. So huge thanks for that. There's a bug in a first terran Brood War mission when the mouse arrow doesn't appear in briefing window. maybe that's 'cause I Escaped the intro, but stil it doesn't show up. Second: why didn't you use Duke's, Du Galle's, Kerrigans classic, etc. portraits for the mod. I've seen that some guys made them. Is there any problems with using them? is the Retro mod also responsible for the whole mess of new custom "old-school" style models I'm seeing here, too? Or did those get baked into the base mod during those few days of limbo? Retro mod does not replaces queen announcer quotes with the alternate ones (zasz / daggoth / mute / ui and drone errors). I said it many times and probably will stop saying that from now, because probably tired you with feedback on Zerg announcer. But... I don't understand. You did tremendous amount of work, and can't accomplish it with small voice replacement? The retro mod adds a lot, if not all, Brood War sounds to the units. So, what's the difference between the "main" mod and the "retro" mod?